replicas of Unity Tactical’s innovative products to the worldwide airsoft market. edge solutions to common problems. They are not afraid of failure or out of the box thinking but strive for perfection in products that hit production. It’s that simple, they are proud to serve this industry and work hard every day to improve the tools for the good guys. They strive to maintain industry leading customer service and continually listen to both their military and commercial customers for product improvements. 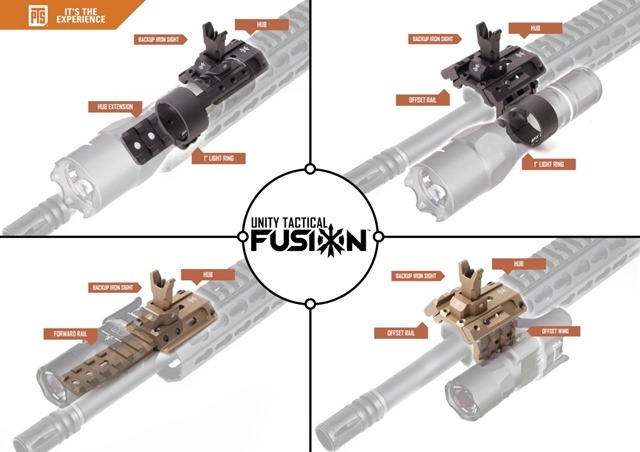 PTS hereby inform you that the PTS Unity Tactical – FUSION Mounting System is start shipping on 07 Oct., 2015. – HUB, the heart of the Fusion system mounted on the handguard rail to which all the other components are attached to, creating various configurations. – Extension, a rail component used to project the whole system forward and can be applied on any of the three positions of the HUB. – BUIS, an extremely compact, folding back up iron sight that can be locked in the upright position with a small set screw. – Offset Rail, attached to either side of the HUB to create a 45° rail placement. – Offset Wing Mount, attached to either side of the HUB to create a 90° rail placement to the top rail. – 1” Light Ring Mount, can be used to mount standard 1” diameter handheld lights directly to the HUB, Extension or Forward Rail. – Forward Rail, extends forward from the HUB at the same height as the top rail. – Various components to adapt or configure to any combat needs and situations.